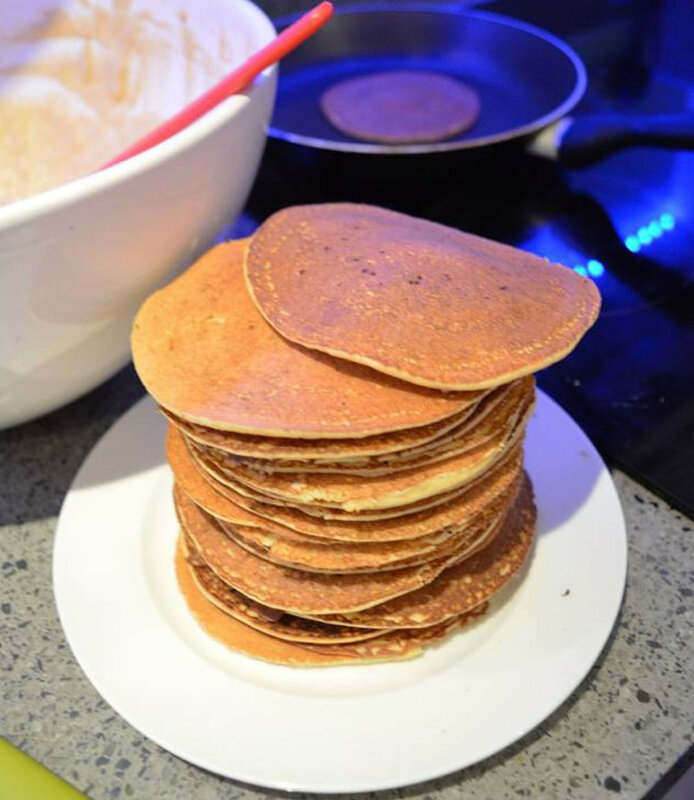 There is nothing like the smell of homemade pancake coming from the kitchen in the morning. This is the basic clean recipe. It doesn't contain any sweeteners or protein supplements. I find it more volatile this way. You can have it sweet or savoury with syrup or fruits and yogurt or even scrambled eggs and avocado ( which is my preferred way). Really up to your taste-buds. Break the eggs in a big bowl and whisk them with the vanilla and coconut oil to get some air into the mixture. You can use an electric mixer or work on your biceps. Whatever works for you. Mix until airy and fluffy. Add the rest of the ingredients and mix well until everything becomes a nice smooth batter. It is important to get a good consistency as too much coconut flour will tend to thicken the batter. If that happens, add more water or coconut milk until you get it right. Use a non-stick frying pan and keep the heat at 7/10. Using a big spoon place approximately 40 ml of the batter in the centre of the pan and gently but quickly start to spread it using the back of the spoon to form a circle. Let it get nice and golden brown on each side before you move to the next one. It should take about a minute for each pancake to cook. There is a lot of debate around which of the two lifts is the most effective exercise to measure raw strength and recruit more muscles in the body. Both exercises are putting most of the load on your hip and thigh muscles, each in a different way. The deadlift clearly recruits more overall muscles in your body, simply because your forearms and biceps are always engaged in the movement holding onto the bar. Especially if you are lifting heavier you will fire these up instantly. While you squat you don’t use your arms muscles, as the bar rests on your shoulders. On the other hand, your calves are not stressed during the deadlift. That is only achieved by the squat because of the way the weight and pressure is spread through the foot during the movement. Deadlifts are the best exercise for your main back chain muscles, i.e glutes and hamstrings. Your back muscles are also stressed while deadlifting. Those of you who are lifting heavy for a while, you probably have developed strong trapezius and rhomboids muscles. Squats place a greater pressure on the front chain, specifically your quadriceps and for that reason it’s considered to be the best exercise for these muscles. Same as the deadlifts, squats also work the hamstrings and glutes. Reaching specific angles between the thighs and the ground will recruit these muscles in a different way. Both of these two lifts place a great pressure on your spine and this is where the core muscles come to rescue. During the movement every abdominal/core muscle is recruited to create internal pressure and support the spine while performing these lifts. PICK ONE OVER THE OTHER? NAH! Both deadlifts and squats are great exercises to perform. They both work your glutes, hamstrings, quadriceps (i.e mainly your thigh and hip muscles) as well as your core/abdominal and arms. If there are minor differences, then they complement each other. If you’re lifting already, you probably won’t pick one over the other. We won't either.